It's always fun to share a passion with your family! My youngest daughter, Colleen, has always enjoyed helping me with our family business, whether that's wrapping soap, making labels, bouncing ideas off of each other or helping out at craft shows. She's also notorious for taking many, perhaps too many pictures with her camera. Just for this post I had almost a hundred pictures to choose from! In December, Colleen will be graduating from college. Even more exciting, for her, she will also be leaving for a 3 week trip with six students from SquareOne to Kenya and Uganda. SquareOne is a student run nonprofit group seeking to empower local economic development by creating lasting business ventures in rural communities in the developing world. As a fundraising adventure, Colleen and I created a soap specifically for raising funds to help the communities in Kenya and Uganda. Colleen in our soap workshop holding a few logs of our African Hope Soap. Here are a few of the soaps, just cut into bars. 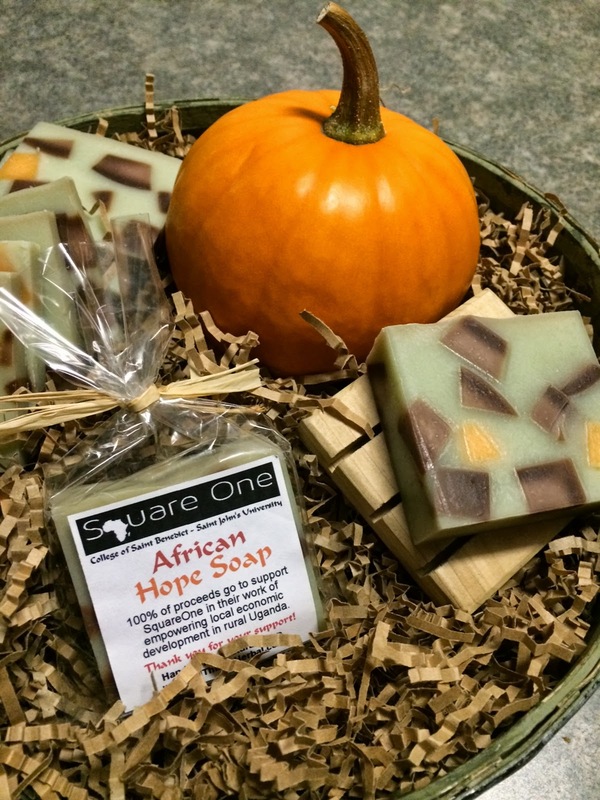 Dubbed "African Hope Soap", the square bars feature a very warm fragrance that we created and blended together. It's a spicy-sweet, musky blend with hints of deep sandalwood, cinnamon and orange and soft notes of vanilla, patchouli and lemongrass. When we were talking about colors for this new soap, we decided to add in some chunks of vanilla bars that I had made earlier. We love the deep brown colors. The vanilla in the soap turns darker brown the more it is exposed to air. This is a shot of the soap still in the mold. You can see the brown and orange chunks peeking out from the soft, pale green soap. A few swirls with our spatula and we left the soap to rest overnight. Colleen, cutting the soap into logs. Eight logs ready to cut into bars! Designing the labels, printing and cutting them out with a paper cutter. Colleen and her group will be selling these soaps this weekend at the Saint John's and Saint Ben's Homecoming Football Game in Collegeville, Minnesota. Stop by and see the SquareOne booth if you are in the area. You may also support their trip by purchasing a bar from our site: http://AllThingsHerbal.com/index.cfm/African-Hope-Soap-Square-One-CSB-SJU. We've donated all the bars of soap to SquareOne, so 100% of the proceeds goes directly to support their trip. To learn more about Square One, follow them and cheer them on at: https://www.facebook.com/csbsjuSquareOne. Thanks for your support! Cool! I love seeing photos of the process! A soap workshop field trip would be so fun. Thank you Jill! Colleen has suggested that I do a workshop tour. I'll add it to our to do/wish/idea list.